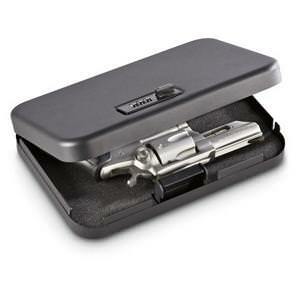 The American Association of Certified Firearms Instructors (AACFI) of Minneapolis, MN has produced a Handgun Security Box for use in your home, office, or in your automobile to provide you a safe and secure temporary handgun security box. Those of us that practice the carrying of concealed firearms have encountered situations where the carrying of a firearm, concealed or openly, is not permitted on certain premises. 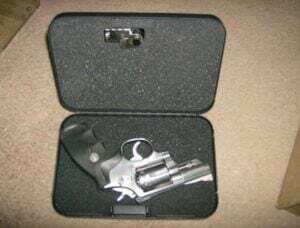 If you do as you should, that being, carry all the time, you are left with few choices that are satisfactory to the safe storage of your firearm at those times. In some venues, it is illegal for you to even exit your vehicle with your weapon to place it in the trunk of your vehicle. I was concerned about this and when I came upon this handy little item in an email ad from The Sportsman’s Guide for a very reasonable price, I bought one. I liked it so much, that I bought a second so I could readily have one in each of my vehicles. I also recommended it to several of my friends that I shoot with regularly. The “Handgun Secure It Security Box“® is just that, a security box, and it is not a safe by any means. It will prevent a “smash & grab” auto-burglary from getting away with your handgun, but it will not stop a determined thief who has the time and the tools to break it open. It is meant for temporary storage, not continual secure storage. The AACFI has two versions of the Secure It box listed on their website, they are Standard Size ( 8.25″ x 6″ x 1.75″ ) and the Large Size ( 9.5″ x 6.5″ x 1.75″ )[see Fig. 1]. The standard size is just right for a “J or K” frame revolver with a snubby barrel or a small ( compact / sub-compact ) pistol. The large size will easily hold a 1911 or full sized Glock pistol or a larger ( 4″ bbl ) revolver or a S&W® N-Frame snubby like my Mod. 66-1 .357 Mag [see Fig. 3]. Of course, if you wanted to, you could keep ’emergency money’ located in the security box too, which is better than the glove box or center console unit. The Handgun Secure It Security Box is constructed of 21-gauge Steel that appears to be a Powder Coat finish that will enhance it’s weather ability. It has an approximately 7.5″ piano hinge that is spot-welded to the inside of the box. 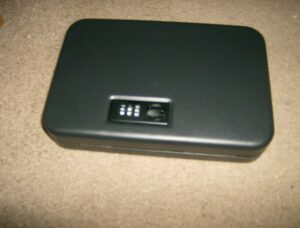 The top of the box sports a 3-digit combination lock that is user set to a private combo. Inside of the box has ½” layer of foam in the lid and ½” of foam on the bottom of the lid to protect and capture the handgun. On the bottom of the box [see fig. 2] is a locking lug made from the same 21-gauge steel that affords a place to anchor the security cable to the box. Two convenient notches are cut into the bottom lid to allow the security cable to exit the box and be attached to the seat frame of your car, or the steering column or any other strong point. In fig. 2 you can see the 2.2M 1500lb. strength cable that will tie down the Secure It Box and the protective foam that lines the lid. At the bottom of the picture, inside the box is the internal locking lug that the lock in the lid latches into. If you wanted to perm-anently mount your Secure It Box there is a pair of pre-drilled holes in the bottom that will afford mounting screws or bolts to the surface that you wanted to utilize for the box. The combination comes from the factory at the standard “0-0-0” allowing the user to select the combination that best suits them. Inside the box is a “L”-shaped lever that slides left and right to release the dials so that the combination can be set. This will allow you to set it to the digits that best suits your memory. Just out of curiosity as to how much abuse that these boxes will survive, I placed the box on the floor and then took my ample physique ( I am 6’4″ tall, 285 lbs.) and stood on the closed and locked box. I did a little rocking back and forth on the box and It did pop as the lock-side corners ‘popped’ over the bottom half. As I got off the box, it made another ‘pop’ and the corners returned to normal position and all it had to show for my stepping on it was a little bit of dust from my shoes on the surface and no denting or creases. I took the box and opened it without any problems and inspected the lock and lock lug to see if they were deformed any, and they were fine. I then loaded a zinc PPK replica gun inside the box with a couple of my CZ-82 Magazines loaded with empty brass, to give them a little more heft. I locked the box and from a height of 6 feet, dropped the box so that it would land on the side of the box on the floor. It made a little noise, like something shifted, so I opened it up to inspect it. the replica pistol had slid to the side of the case that struck the floor but did not show any damage to it’s finish or the inside of the box. The magazines did the same thing, but showed some fine rubbing from the two mags hitting on each other in the fall, but nothing that would impair their operation, and certainly less damage that they would have sustained being ejected from your pistol and falling to the ground on a tactical or strategic reload. The ‘Secure It’ safety box took more abuse than it would under normal circumstances and held up. 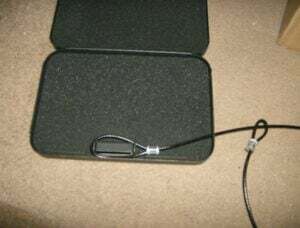 Figure 4 shows the inside of the box with the security cable attached to the locking lug station, the most secure use of the cable that I found. There are two ‘slots’ for the cable to be routed through, Figure 5 shows them in use. Either way, the Secure It Security Box is a safe and responsible way to store your carry handgun temporarily in your vehicle or home. All-In-All I would say that the box would be sturdy enough for short-term storage in your vehicle while you go into the Post Office, restaurant or the Bank that won’t allow you to carry concealed or openly on their premises. Using it, you won’t have to worry about the auto-burglar that breaks into your vehicle to find any valuables left inside, as they very rarely carry a lot of tools with them and they certainly are not going to be able to rip it from your seat rails. 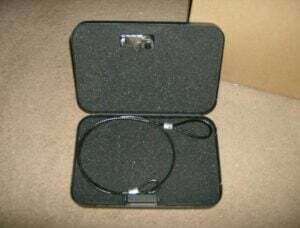 It is a strong and sturdy security box that does not cost a lot and yet provides the added insurance that your carry weapon is secure in your vehicle. There are no batteries that need to be replaced, only a mechanical dial combo lock that can be user set to a personal combination. Keep your revolver or full-size semi-auto handgun close by, but still out of harm’s way. 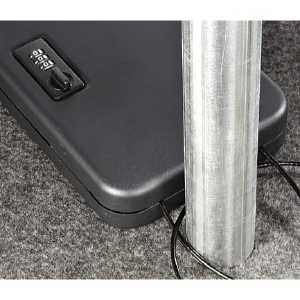 The Secure-It® Storage Box can be tethered with its 1,500-lb. test security cable under the seat in any car or truck, or at home in a compact space. It can also be hidden in a purse or briefcase. And wherever it goes, the only one who’s getting inside is you, with the 3-digit combo lock! Meets TSA airline firearm guidelines. Measures 9 1/2 x 6 1/2 x 1 3/4″h., weighs 2 lbs. Buy the Handgun Secure It Security Box for only $29.97. Sportsman’s Guide ® is a registered trademark of Sportsman’s Guide, Inc.
John is an Air Force Retiree with over 20 years of Active Duty Service and a Vietnam Veteran. He is a former Law Enforcement Officer having served as Chief Deputy Sheriff with the Carter County, Missouri Sheriff's Department, and Reserve Officer for small rural Police Departments in Carter County, Missouri. John is now fully retired from Pitney Bowes, Inc. and lives on a small farm in Southern Missouri's Ozark Foothills region, and enjoys his private shooting range.